Signing up for my first ever crochet along was a fantastic decision. I learned many techniques and stitches, and one of the things I quickly learned was how to adjust my squares to get them all to the target size! 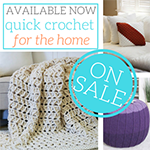 Now I’m sharing that with all of you, so you can always get your crochet squares the size you need! 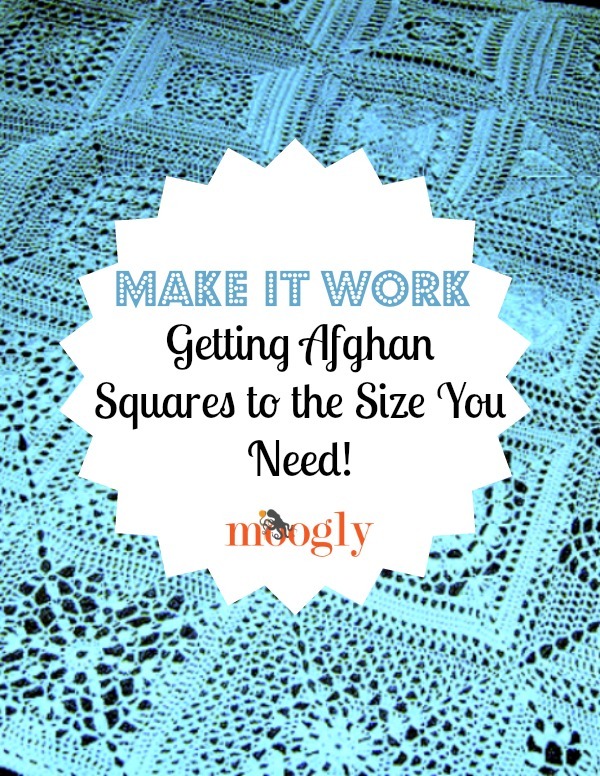 Whenever you make an afghan from blocks or squares, size becomes an important factor. Unless you’re mixing small and large squares on purpose, you’re going to want to get each square as close to the target size as possible. But when making squares from different designers, that isn’t always as easy as it might seem. Two designers might have both written patterns for 12″ squares – but they might have very different tension levels. And when the same person makes both, they end up with one square that’s 13″ wide, and another that’s only 10.5″. Luckily, this is easy to fix – without frogging the whole square! Just make sure never to cut your yarn before you measure! 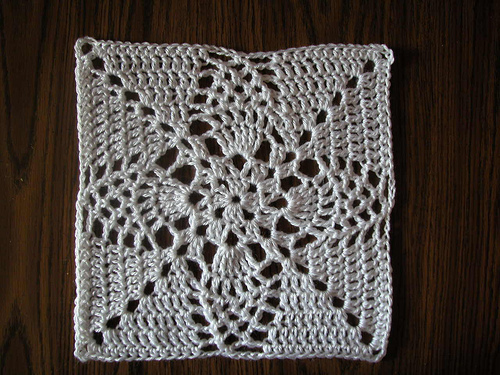 Above you see the square I made several years ago, using the pattern Flower Burst Square by Chris Simon. 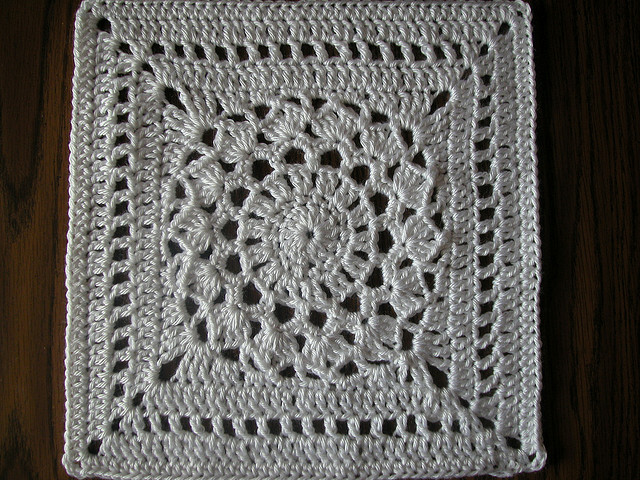 When I made this square according to the written directions, I came up an inch short – only 11″ wide. But rather than frog the whole square and redo it with a larger hook, I just added an extra round of half double crochet stitches – and got to 12″ exactly! In my experience, a round of double crochet will get you over an inch of extra width, half double crochet about an inch, and single crochet a bit less than that. But that’s my tension – you’ll want to take your own measurements. So if you get to the end of a square, and need an extra row (or two! ), try a few stitches and then take out the ruler. Measure the height of that last row, and then double it. Add that to your current width, and continue or adjust the stitches as needed! But what if the square is too large? Then in that case, yes, you’re probably going to want to undo, or frog, some of the stitches. But not the whole thing! If the last row is primarily double crochets, then pull that row out and sub in half double crochets or single crochets. Or leave it off altogether if needed! Personally, I like to measure as I go. For instance, the above picture is my version of the Pineapple Granny by Priscilla Hewitt. 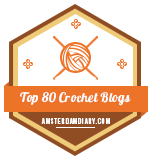 As I approached the end, I found that I was very nearly at 12″ already, and wouldn’t have room for the last row of double crochet. So I did it in half double crochet instead, and it worked out fine! 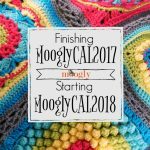 So with this post, I want to encourage all of you participating in the MooglyCALs (as well as all of you who aren’t!) 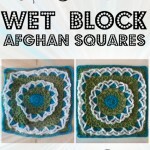 to not fret if your squares don’t all turn out at exactly 12″ as written. 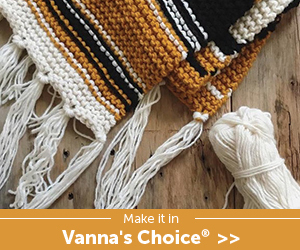 Over the course of the year we’ll be making patterns from many different designers, and while I’ve focused on 12″ squares all made with the same weight yarn and hook size, it’s pretty much guaranteed that some will measure up for some better than others. And that’s okay! Adding or subtracting, or substituting rows at the end of the square is all part of making a mixed squares afghan. 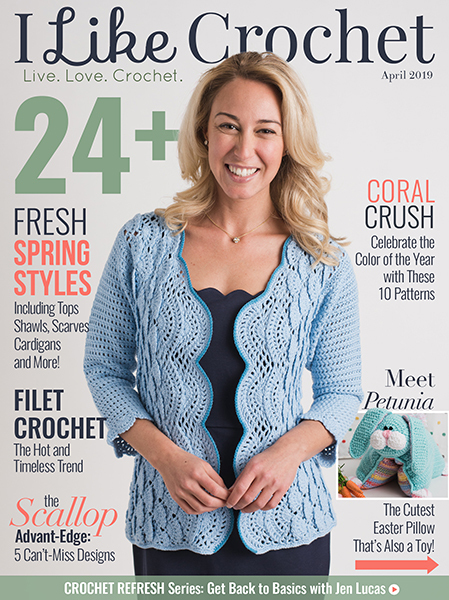 It’s okay if yours is a little different than the next person’s – crochet is an art, and everyone’s art is unique! Thanks for reading! Get Moogly on your favorite social media sites: Facebook, Twitter, Pinterest and Tumblr, and sign up for the Newsletter so you don’t miss a thing! Perfect – thanks for the info! Great solution Lori! 😀 And thank you! Hi Tamara, wondering if you posted directions about squares with different stitch counts and how to go about joining them anyway. Hi Pam! I’ve been working on a post about that for some time – it’s a simple idea, but once I started writing about it, I just kept going. I hope to have it ready for publication soon! When I first saw your CAL post the other day, the first thing I thought about was how hard it would be to keep the square sizes uniform, because of a previous experience. I made a throw recently where each granny square was a different design. They were all from the same pattern book, so the last row of each square had the same stitch count, which was a great plus. But, since I was using a different solid color for each square and some of the yarn brands were different, I had a problem with the squares coming out different sizes. I realized the problem quite early on and I adjusted the squares using different hook sizes and changing the stitches on some of the rows as you just suggested. I did pull out many stitches, though. I would rework rows on some of the squares multiple times. I probably could have made three throws in the time it took me to make that one. (LOL) I didn’t want the last row stitch count to be different, so I didn’t want to just leave a row off. I was able to use the same stitch and hook size for the border row on all the squares, because I did those with white. That helped with assembly. I am curious to know how assembly will be done on the CAL. Will all the squares come from different designers? If so, how will border stitch counts be accounted for when assembling at the end? I am looking forward to see the next square. 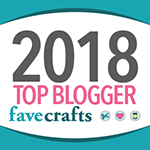 I want to thank you for your blog and for taking the time to share with so many your talents, ideas, and patterns. I really appreciate it! I love your blog and love your work. Ps. 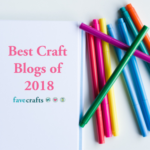 You have a wonderful blog! Can you do a review of the best way to sew in ends? I did a granny square afghan with lots of blocks, and the blocks are already unraveling. I’m glad you posted this, I was a bit worried that my squares wouldn’t turn out to be 12″. I’m so glad I found your blog, it’s great! I like that you post a lot of smaller projects that are faster to finish. 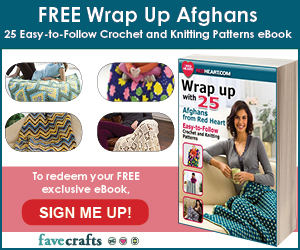 Accidentally fell onto the crochet along Anticipation 12″ square afghan. I’m excited to be part of a crochet community and start the project. My question is, how many squares are typically made of a single design? Also, how much yarn should be bought to insure you have enough for the entire project? Hi Tamara!! I just started crocheting in November and I’m excited to learn with this CAL. I finished all of the rounds of the first square and my square is 10.5″. I was going to add a row of hdc or dc to make it wide faster but I don’t know how to do the corners with those stitches. Round 18 had three different stitches to make it “square” so I assume I cannot just do one stitch all the way around. Thanks!! Hi Teresa! For the corners here I’d either work 3 dc in each corner (if making dc sts), or maybe 2 dc, ch 1, dc in each corner. Try both and see which one you like best! 🙂 With an inch and a half to go, dc will probably work better than hdc. Thank you for the great info! Much appreciated. THANK YOU SO MUCH FOR ALL YOUR HINTS AND TIPS ON HOW TO GET THE BEST OUT COME WHEN WE HAVE FINISHED THE BLOCKS AND FINIALLY SEWN THEM ALL UP . I PRAY MARGARET WILL LOVE IT AS MUCH AS I DO. AGAIN THANK YOU. FROM YOUR FREATFULL FOLLOWER IN VICTORIA AUSTRALIA. Thank you so much Jo Margaret! <3 I’m sure she will! 😀 I hope they help! I know I learned a LOT my first CAL, and I’ve learned more in each one since! thank you for this blog . I appreciate the encouragement and invites. It is helpful for us all to know that there are ways to correct this. Hi Kim! No worries about the email – email addresses aren’t case sensitive. 🙂 I’m glad you like the block! In Australia, our worsted is equivalent to 10 ply. Here’s a chart that might come in handy: http://www.crochet-knit.com/yarn_conversion.html Of course, you can use thinner yarn and a smaller hook for smaller blocks if you like. I believe last year lots of UKers used DK, or 8 ply, and made 10″ blocks instead. Tamara, Here we are in 2018 and still more questions.! Last year when I completed squares they were mostly 13″ so I made all of them that size. This year I am a better crochet-er. Or my hook is allowing me to do a better job. Anyway, when I get to then end and I lay down a ruler on the square, it is usually 10.5. (using Red Heart regular weight yarn). 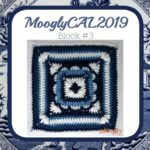 Since I am doing the wet-block method of blocking, I have not been adding any more rows, but instead have just stretched the squares to get 12″. Is that correct? or should I be aiming for them to be 12″ with a ruler laying on top of it, dry, as soon as I am close to being done? Love doing these CAL squares! Thanks!